Discipleship is a daily learning and growing process. In FrontLine Clubs we wanted the focus to be more on that daily faithfulness than on the long term award. We wanted the clubbers to come to club because they enjoyed the club meetings, rather than to fulfill their attendance requirements for a big fancy award. During the process of defining uniforms and awards we were convicted with the thought that this is exactly what God wants for us in our Christian walk—daily enjoyment and growth, not guilt and drudgery while we wait for the prize to come. Could we possibly build a discipleship program for our children with an incentive program that accomplished this to some degree? We had to try. By now you probably recognize the common theme in FrontLine Clubs. The goals of growth, learning, and enjoyment have been packed into every aspect of the Clubs from the written material, to the games, to the crafts, and even to the BX. If the experience of involvement in the clubs (and with Christ) is rich and rewarding, participation will be voluntary and enthusiastic. But our God also promises specific and amazing rewards to those who faithfully serve Him. 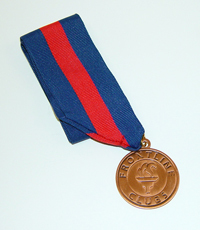 In FrontLine Clubs we have designated specific awards for the faithful service of our clubbers. Another consideration we faced when developing the incentives program had to do with the frequency of the awards. Just as obedience to God nearly always brings a certain immediate joy, we wanted to give immediate rewards for faithfulness, as well as cumulative long-term rewards. 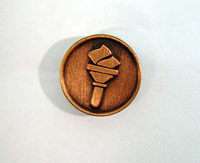 We wanted the rewards to be visible; specifically, something designed to be worn on the uniform (rather than taken home to be lost or forgotten). In the military you only have to look at a soldier's uniform to know his rank and accomplishments. Yet the items worn on a military uniform that indicate these things never overpower the uniform itself. We attempted to reflect these noteable features in the FrontLine uniforms and awards. When choosing the awards, we wanted things the clubbers would value. 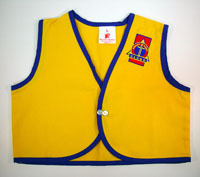 Rather than cumbersome trophies or cheap ribbons that are either hard to display and store, or easy to lose, we chose quality, metal collar pins, colorful patches, large medals hung on colorful ribbons, and useful gifts such as Christian books, recordings, and Bibles that the clubbers will enjoy.